The other day, Google introduced the new Google bar, which some hate and some love. But not everyone can see it. A Google Web Search Help thread has users asking how they can enable the new Google bar. Currently, the new Google bar has not been rolled out to most users. I personally do not see it, but everyone should see it by the end of the week (at least, that is my guess). 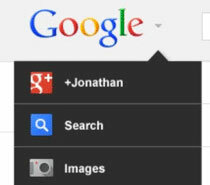 If you cannot wait till then, Alex posted on How to Try Google's New Navigation Menu. So give it a try if you can't wait for the new Google bar.